^^ This gorgeous mural is located in The Gulch! Basic or not, getting a photo here was a 'must' for me on this trip. 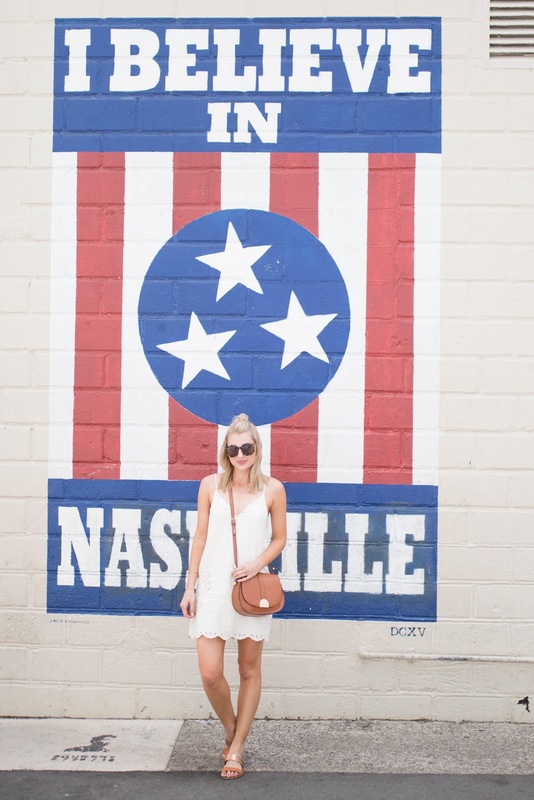 We enjoyed our trip to Nashville so much that I wanted to share some photos from the trip, as well as some recommendations of what to see, eat and do! After exploring Nashville, I think it's somewhere we could easily live. It was easy to get around and there's so much to do! We rented a studio apartment through AirBnB that was located just off of 8th Ave and less than a mile from the 12 South neighborhood (so convenient, and way less expensive than a hotel). We were walking distance from quite a few great restaurants, bars, and live music venues, and an inexpensive Uber ride from pretty much everywhere we wanted to go. Located in the Germantown neighborhood, Butchertown Hall is kind of a BBQ/Tex Mex fusion. It was undoubtedly one of our favorite meals of the trip, and the decor and architecture were just as amazing as the food! The queso is an absolute must if you go (it has chorizo and pico de gallo mixed in and I'm still dreaming about it)! This is a really fun restaurant in the 12 South neighborhood and we raved to each other about every bite of food we ate. Their margaritas are hands down the best I've ever had. I should have stolen the recipe somehow! ;) You also must get the fish tacos, the pork belly tacos, and the fried oyster tacos, as well as the churros for dessert! I'm not a coffee expert and don't drink it more than 2-3 times per month, but this was a super cute coffee shop with a darling patio in the front! It's located in the Germantown neighborhood, and everything about the street and area is incredibly charming. So when we got to Nashville, we learned that it's famous for hot chicken. Basically, it's super spicy fried chicken and while I'm not a huge fried chicken eater, we both though it was freaking delicious! Party Fowl has great hot chicken, and I stepped outside of my comfort zone and got the hot chicken french toast, which sounded so odd to me. But oh my gosh, the mix of sweet and spicy was melt-in-your-mouth good. This is a Nashville hot spot, and after trying it we totally knew why. Their biscuits melt in your mouth and they have all kinds of breakfast sandwich options with them. Trey had the hot chicken biscuit and while our mouths were on fire, it was soooo good. I went for a safer option after a couple too many drinks the night before :) We first tried to go on a Saturday for brunch, but there was an hour line out the door. We went back on a Monday and there was only a 5 minute line, so I definitely recommend going on a week day if you can! This little fish spot was a short walk from our rented apartment and had a daily happy hour - score! We went on a Saturday evening before a concert and they had $6 sangrias that were divine. Their crab rangoon dip and french fries were delicious as well! This was definitely one of our favorite spots we found! It's a huge building in downtown Nashville that's right on the river. It was an old warehouse that has been converted into an incredible dining, drinks, and music venue. The first floor has live music and a pretty big food menu, the second floor is a lounge with a sushi bar, the third floor is an event space, and then....there's an amazing rooftop patio that overlooks downtown Nashville, the river, the Titans stadium, and the big pedstrian bridge. We hung out here on our last night in Nashville and had such a wonderful time! I don't remember the name of our sushi roll pictured above, but it was one of the best I've ever had, and everything else we watched them make looked incredible as well. We also listened to some live music for a bit, and then spent an hour or two relaxing together on the rooftop patio and soaking in the beautiful view. -Sutler Saloon/The Basement - the Sutler has great live music and good food too (although it's a bit pricey)! If you go, get the guacamole trio! The Basement is a separate lounge downstairs with reasonable drink prices. 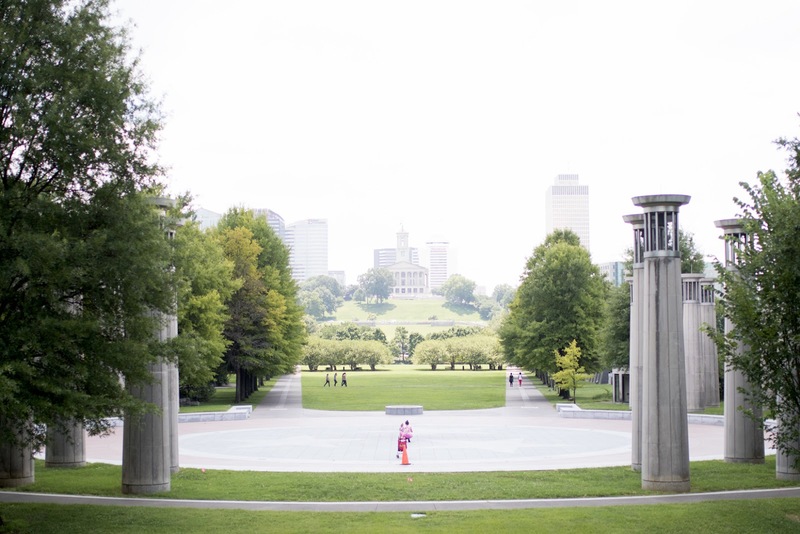 This was one of our top 2 favorite parts of Nashville. The actual 12 South district has a bunch of shops and restaurants, and is so cute to walk around. We visited this area multiple times to check out different things and restaurants. It's also where the famous I Believe in Nashville mural is! Another one of my favorite parts of the trip was driving around and looking at the homes in this area (does anyone else do that everywhere they travel??)! It was seriously the most beautiful area, and had this incredible yet perfect mixture of modern and craftsman homes...all pristine and so so nice. I probably couldn't afford to live in that area, but it's definitely where I would want to be! We were literally pointing out every house to each other. While we didn't go into any of the honky tonk bars downtown (they were so packed! ), we still really enjoyed the downtown area, especially the pedestrian bridge. It crosses over the river and overlooks the city. It was beautiful, and we even got to see a proposal! Other notables downtown are Ryman Auditorium, the Nashville Convention Center, Hatch Show Print, and the Country Music Hall of Fame. This is a large, beautiful park with lots of walkways and things to do and look at. There's also a large indoor/outdoor farmer's market with all kinds of international food. We were too full to eat, but it all looked amazing. If you walk up to the north end where this photo was taken, there's a beautiful view of the park and capitol building. The Tennessee state capitol building sits up on a hill and is so pretty! It was way too hot to hike up the [steep] hill to look at it up close, but I would definitely like to next time we're there. This was a really cool area of Nashville with lots of shopping and food! It is definitely a newer "hip" area. There you can find the gorgeous angel wing mural at the top of my post, as well as Biscuit Love and an amazing Urban Outfitters. We shot this outfit post down there! Nashville is obviously known for its live music (there's actually so much more than just country) and it's no joke. There are so many talented people there! We went to the Gary Clark Jr./Raury concert at Ascend Amphitheater in downtown Nashville, and it was such a great venue with the skyline framing the stage! We also heard great live music at the Sutler Saloon and Acme Feed & Seed. There are lots of singer/songwriter nights around town so if you're into that be sure to do some research beforehand or ask local people where they like to go! The Bluebird is featured commonly on the TV show Nashville, but supposedly it's equally amazing in real life! From what I heard you need to buy tickets in advance though. Germantown is such a beautiful area of Nashville just northwest of downtown Nashville. There's a mixture of gorgeous newer apartments and townhomes mixed with stunning and eccentric older homes. There are lots of restaurants and boutiques down there too, so it's just a great area to spend some time walking around! I loved walking around the area. I mentioned Butchertown Hall and Red Bicycle above, but I also tried a juice shop called the Juice Bar that was some of the best green juice I've tried. Germantown is right by the Bicentennial Park I talked about above, so those are good to combine within the same morning or afternoon. Details on my white dress can be found in this post, which we shot in Germantown! -Drove around the Vanderbilt & Belmont campuses. Both were beautiful! I'm sorry that post got so long, but hopefully you got some good info if you ever want to visit Nashville! Overall, it was a pretty affordable trip, and we had so much fun exploring there! It's just a really fun and vibrant city, and everyone we met was so friendly and eager to give us suggestions. Please let me know if you have any questions, or suggestions for our next visit!